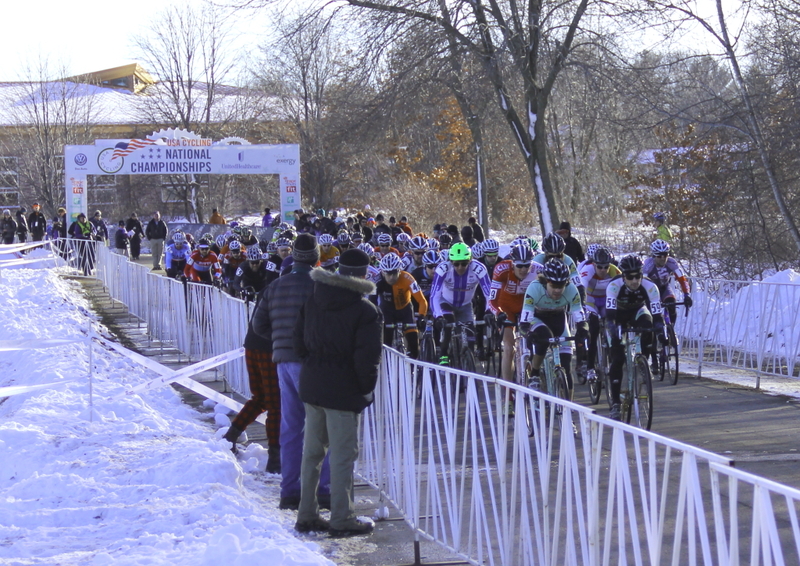 The riders at Cyclo-cross Nationals in Verona, Wisconsin are like kids in a candy store, with a few significant differences. At ‘cross Nationals, the candy store is Badger Prairie Park where a track of squishy mud and frozen ruts runs through open fields of snow perforated by the tips of brown-gray branches and tall grass. Instead of which sweets to choose next, riders choose their next lines along the track – outside edge to inside edge, through the middle, or some combination. Sometimes the bike and the mud and ruts choose for them and toss them onto the ground where they slide ten feet in the mud or kick up piles of snow until they can right themselves, shake their heads, and remount their bikes for more. On Wednesday Adam Craig (Giant Factory Off-Road Team), Brady Kappius (Clif Bar), and fifty-six other male “kids” raced one-geared bikes into the ‘cross National candy store. After the starting whistle Aaron Bradford (Bicycle Bluebook/HRS/Rock Lobster Cyclocross) led the single speed pack down the paved starting straight with Kappius on his wheel. Both Craig and Kappius rode traditional ‘cross frames. While Craig turned over the 42 x 16 “magic gear,” Kappius had decided to go with a chain tensioner and 39 x 15, a decision he soon regretted. The tensioner broke after the run-up in the first lap. He coasted down the hill, dismounted, and at a pace that seemed like slow motion, stepped over the barriers and pushed his bike by the seat into the pit area. “The pulley came off the bearing; I’ve seen it happen a couple of times but it never happened to me,” he said after pushing his bike into the pit and calling it a day. “It’s a bummer,” Kappius said. “I spent all this time coming out here so early. I don’t know…This isn’t the right way to do it. The right way to do it is to have a real single speed bike. So, next year.” He looked outwardly calm, but words came out a bit shaky. His teeth chattered slightly in the late afternoon cold. When asked if he was more pissed off than he let on, Kappius said, “I’m just pissed off at myself. I should just spend more time with my equipment and care a little bit more about this race…” He said he could have brought his single speed bike. Instead he brought the bike he’s been riding all season; he said before the race he likes how it handles. He could have run the “magic gear,” a selection he made recently at Castle Cross. “It’s my fault,” he concluded. Kappius will ride in the elite race on Sunday. Craig rode hills others – including Bradford – ran, and negotiated twisty descents with efficient lines. He gained thirty seconds over Bradford about half-way through the race; that lead increased exponentially in the second half and he finished two minutes and nine seconds over second place Bradford. Bradford also stretched out his lead over a chase group of three as the race progressed. Isaac Neff (Trek Cyclocross Collective), Jared Nieters (SEAVS/Haymarket), and Adam Myerson (Team SmartStop p/b Mountain Khakis) almost came to the line together. According to the race announcer a mishap in the sand pit by Myerson helped Nieters move ahead. Neff came in third with Nieters fourth, just one second in front of Myerson. As he spoke, Craig stomped his feet. He seemed pleasantly surprised that plaques of mud leapt off his shoes. He obviously enjoyed the forty-three minute effort. 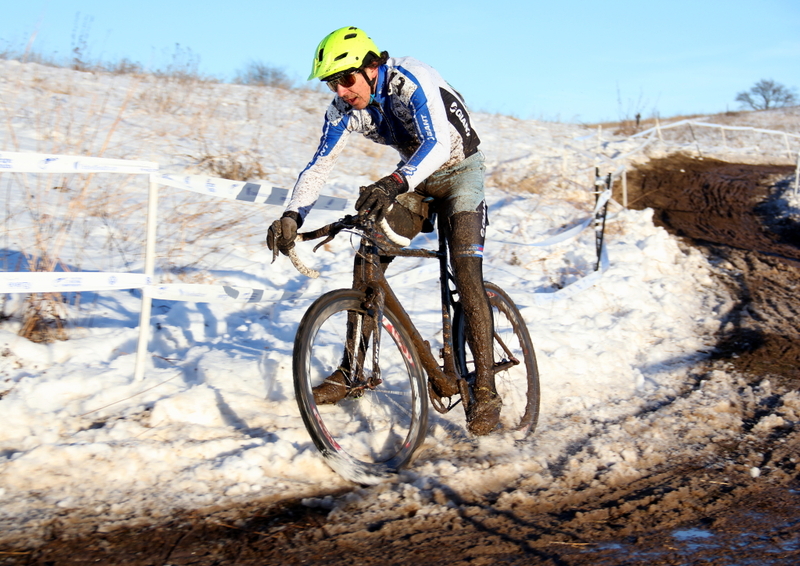 “Anytime you can throw snow in the air on your cyclocross bike is entertaining,” he said. Craig will also ride in the elite race on Sunday. 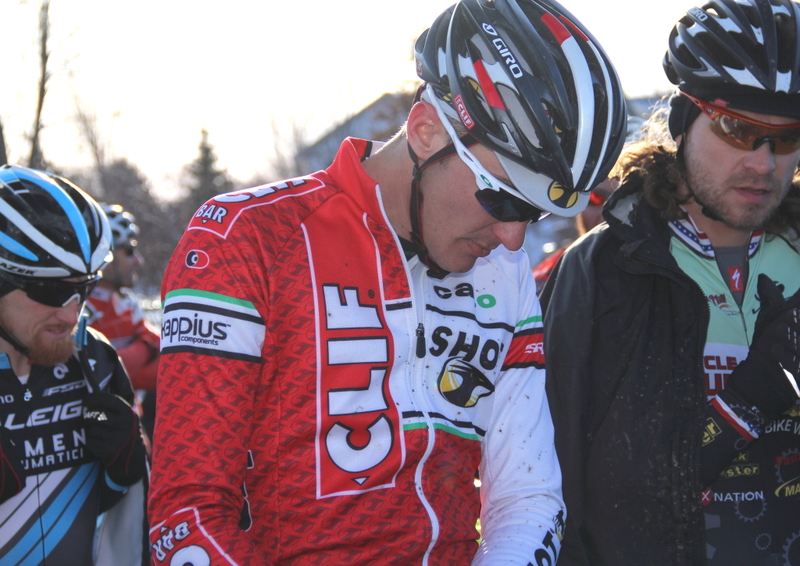 « Can anyone or thing stop Logan Owen’s bid for an 8th junior national cyclocross championship?